I received a nice email from a first time guest at our church this past Sunday. Part of the note said,"I really enjoyed your lesson on Sun. Your "please gossip, whine and complain elsewhere" policy is refreshing. We plan on returning to Nags Head..."
"Refreshing" is that feeling you get when you first brush your teeth in the morning. All the scum that has fermented in your mouth overnight as you slept is cleaned out and your taste buds aren't gagging. Sunday I shared our position on why we don't allow divisive people to stick around. We actually have had to ask people to find somewhere else to spread their venom, since it was obvious they weren't with us to worship and serve. My guess is that most pastors wish they could take a similar stand, but don't because somebody has them on a short chain, either a board or whoever controls the purse strings. The sad truth is that job security among pastors is non-existant in many circles. At the whim of a few many a good pastor has found himself kicked to the curb. So, telling someone to stop being divisive and a burr in the saddle of the body of Christ, "might offend Sister Flapjaws and we sure don't want to do that!". What's gagging the church is allowed to go on. Never mind that "Sister (or Brother, for that matter) Flapjaws" is an offense to the cause of Christ. Lest you think I'm a bit harsh, let me quote from one of my role models. If anyone is causing divisions among you, give a first and second warning. After that, have nothing more to do with that person. For people like that have turned away from the truth. They are sinning, and they condemn themselves. Church halitosis will keep those you're trying to reach from getting close enough to hear your message. (Please don't let this dancing thing leak out. But if you want to see a bunch of us Baptists dancing, look here. Today is my first daughter and middle child's birthday. Also her first as an old married woman! Happy 24th! Hope you and what's his name have a great time at Busch Gardens. We miss you! A Question of Will: Thin Ice or Firm Foundation? A few years ago a friend whose son had a very bad type of cancer. The father was a believer and like any father he wanted more than anything else for God to heal his son. A committed believer and church member, he was also involved in a men’s group where some well meaning Christians convinced him that God wanted to heal all who are sick. Not only that, they encouraged him to “hear” from God about his son. So he prayed. Now, prayer’s not a bad thing, is it? Of course not. But what is the basis of prayer? Is it our desires or is it God’s will? What did Jesus say in Matthew 6 – what we commonly refer to as “The Lord’s Prayer”. You know that line that says “Thy will be done”? Yet Jesus also said, “Ask what you want and it will be given to you”, right? So which is it? God’s will or my will? Or can it be both? As a result of his prayer he was convinced that God told him his son would be healed. And with that thought he became really positive about his son getting better. After all, he believed God had showed him in a dream or something, I guess, that things were going to work out OK and that his son wouldn’t die. What’s the basis of your faith; your prayers? Is it right to trust your own understanding and hope that your feelings are God given? What if they’re not? Can’t we convince ourselves that God has spoken? That God has revealed something to us? That we’re praying in God’s will when maybe we’re not? One of the old Gospel songs I grew up with was “Standing on the Promises of God”. You probably remember that song, too. But if not, the words talk about standing on the promises of God that cannot fail. Paul wrote these words to Titus: “This truth gives them the confidence of eternal life, which God promised them before the world began—and he cannot lie.” He cannot lie means He always is truthful; always faithful to His Word and His promises. And His promises to us are found in His Word. My friend’s son died. When I heard the news I went to see him and he was crushed. It wasn’t the normal grief a father would have (I’m not sure normal is the right word), it was grief compounded by both the loss of his son and his faith. The problem my friend had was that his wishful thinking became a substitute for God’s Word in his circumstance. His faith in believing that his son would recover and live wasn’t really faith in God’s Word, it was faith in his own desires; in his own will – not that there was anything evil or wrong with those desires. But apparently his son’s healing was not in the will of God. I know that there are some who disagree with that last statement. They’ll say, “But when he arrived in heaven he was healed!” But (hypothetically), what if he didn’t get to heaven? Or they’ll argue that “It’s always God’s will for people to be healed.” Then please explain funeral homes to me. We live in an unredeemed body and physical death is a reality. Sorry, death is the result of no healing. You can’t have your cake and eat it, too. It was very sad when he asked me why God would go back on His promise. So I explained to him that it couldn’t have been God who spoke to him about his son living, because God is faithful. God never makes a promise He doesn’t keep. God’s Word is as good as gold. You can take it to the bank. Sometimes I’ve been guilty of doing the same thing as my friend – convincing myself that what I want is what God wants. But that’s thin ice if we’re going to stand strong as men and women of God. The best place – the only sure foundation - for us to stand is on His Word. Does that mean I shouldn’t pray for God to give me the desires of my heart? No. Of course not. Especially if there is nothing in your desires that violates God’s Word. But sometimes for our good and for the good of the big picture we can’t see, God doesn’t give us what we want. Our understanding is limited. Our desires can be flawed. But His will never is. And if He doesn’t answer your prayer the way you want, don’t get mad. It just means that the way He wants is going to be better somehow in the long run. Gail commented to me at lunch today, "Have you noticed all the new young adult couples at church?". Frankly, I can't keep up with them all. I'm not sure where they're coming from, but it's so exciting to see us hitting our target. And with young couples comes lots of kids. We're crawling with 'em. We gotta get that upstairs area finished off asap. Also today was our Ministry/Missions Fair with our ministry and mission teams setting up displays and giving everyone an opportunity to find a place to plug in to serve and reach out. I'm at church at 8PM, having come out of our CREST meeting (communicating/responding/energizing/strategizing/training). Our Connection Group leaders are meeting for some training right now. Great meeting. It gives our Ministry Teams an opportunity to share what God is doing and is always upbeat. No "business meetings" for us! And our Honduran Mission Team that got home at 2AM was in church this morning. You guys rock! Great day all the way around. The amazing thing about the church* is that because it is a living organism (as opposed to an organizational institution) we get to watch it grow and mature and change all the time. And as God teaches and moves us, He changes us by revealing more and more to us about Himself and about ourselves. Every week I hear more and more stories from and about our church about how God is using you and giving you greater insights into His purposes for your lives. Every week someone tells me how God has healed; changed; challenged their lives. Pains and hurts are part of this life as well, and we're not exempt from them, either. And whether those things are in little areas of life or are huge miracles, they’re all significant, not only to your life, but to the church body. Paul wrote that when one of us hurts, it hurts us all. And when one of us rejoices we all celebrate, too. No one in the church should ever be alone (although I know plenty who have secluded themselves and their hurts because of pride or fear). Nothing else on earth compares to a healthy church. *A local body of believers called together to be the community of Christ. Cal Thomas,syndicated columnist, wrote an excellent piece on the impact of 35 years of legalized abortion in the US. Read it here. It's tough to make a real good comparison. After all, Nathan was 3 months older at birth than Gwyneth! But can you see any resemblance? Last week I had a dialog with a fellow Christ-follower about sharing the Christian faith with those who don't yet believe. The dialog came about because she emailed me about praying for someone to come to know her Savior. Sometimes believers, because of the life-changing experience that resulted from their faith, can forget what it's like to be on the "outside" looking in. We can forget that not everyone is receptive to the Gospel and some just aren't interested in hearing it. And if we forget those things, or worse, are insensitive to those things, and we try to pursue someone and convince them without regard to their receptiveness we can do more damage than good. Our purpose is to point people to Christ, by our words, sure. But more importantly by our lives. It's the impact of seeing someone filled with joy and hope and stamina through life more than our theological arguments that is most effective in "breaking the ice". Let them see Jesus being lived out in you. Our purpose is to dialog not to argue and slam them for their equally strong held beliefs, whether they be in another religion or no religion at all. When we don't respect them (and respect doesn't equate agreement) and that lack of respect comes through in our words, we're not pointing. We're shooting. Shooting them in the heart with our perceived disrespect and shooting ourselves in our evangelistic feet. And trust me. Shooting is always easier than pointing. I know. I've been a Gospel gunslinger. Mohandas Gandhi is reputed to have said, "I like your Christ, I do not like your Christians. Your Christians are so unlike your Christ." Apparently he had seen enough of Christians shooting and not pointing. Don't be concerned with notches on your belt. It was a cold one here! But at least the rain had moved on. God even gave us a little snow flurry between gatherings. It's been several years since I last spoke on the sanctity of life, but chose to do so today because I've seen up close and personal how choosing to trust and obey God rather than culture and finite wisdom resulted in the birth, rather than abortion of my grandaughter. Seeing a baby born at 24 weeks ramped up my appreciation of life more than a few notches. The message hit home with many. I've learned to be sensitive when addressing "controversial" topics, but to speak the truth as best I can with grace. Several talked with me about past decisions that continue to haunt them and their families. Thank God for His grace and forgiveness. And that's how I wrapped up the teaching today. No matter what wrongs your past holds, God will forgive if you just ask. The songs were wrapped around the theme of God's creation and how He knew our hearts before they were formed. I love the dynamic that our lobby gives us both before and after worship gatherings. You can't get people to leave! But it's not just the lobby, it's the genuine community our church possesses. Met several new guests today, too. Our Honduras Team is off on their trip, and their absence was noticed! I've linked their blog so you can check up on their trip, which was eventful even before leaving ORF! I arrived back at the hospital this morning and went to visit Gwyneth. After about 15 minutes her other grandpop showed up and the two of us sat on either side of her in wonder at this incredible gift God has given. Both Don and I had some prayer time with her. Today they'll gradually take her off of the jet vent she's been on since yesterday and put her back on the conventional vent. The nurse says she's "fiesty". Lots of wiggling her feet and moving her hands and arms. Her color looks great and she seems very peaceful in her artificial womb. Tomorrow I'm using an updated video Nathan put together "Hands on a Miracle" as part of my message to Nags Head Church, "Stand With God for Life". We'll be passing out the Kleenex first. Tonight I was in Tricia's room in ICU while she and Nathan viewed a video of Gwyneth that Gail shot when the baby was a day old. I stood by the bed and watched her watch the video and watched him watching her. The only thing better will be when she gets to see Gwyneth firsthand, and that will be topped by the first time she gets to hold her baby. I grabbed Nate's camera and took a few shots of them watching the video. If they turned out OK I'll post them here tomorrow. She also watched the slide show and Christmas and vacation videos Nathan has posted on his blog. It's been a fun evening! I know I already said it, but just seeing her alert, laughing, crying, talking and able to see pictures of her baby is such a joy. I can't imagine how she and Nathan must be feeling right now. My three children were all born without complication and I was there, witnessing their births, seeing them fresh out of the oven. And as wonderful as those experiences were for me, this takes on somehow an even more special aura. I can't describe it. You just had to be here. But I kinda think you are. It's Friday morning and I'm at Duke Hospital. Just spent 30 minutes or so in the room with Tricia and Nathan. I can't tell you the combination of relief and joy it is to not only see her awake and smiling, but talking. Her words aren't audible due to the tracheotomy, but Nate does a great job of reading her lips. We went through some of the experiences she's had in the past week; talked about the baby a lot. She can't wait to see her live and in person. But she wants to wait until her blurry vision clears up first. We also talked about the thousands around the world who now "know" her. She just asked that everyone be praying. She's got a long way to go, but she's come so very far. After lunch I'll go visit Gwyneth. I know she's been wondering where I've been the past few days. I may do another dance. I believe in the sanctity of human life, primarily because I believe life is sacred and God is all about giving and protecting life. But sometimes such beliefs contradict conventional wisdom. Years ago I heard that abortion might be permissible in certain cases, like to protect the life of the mother. OK. That sounded reasonable to me. But some would argue, "Come on. How often does a pregnancy put the life of the mother at risk?" It's easy to proclaim yourself to believe in something that never touches you; that you never experience up front and personal. And it's easy to work into positions compromises based on "logic". Until it dares you face to face. When my son and daughter in law discovered they were expecting the day before she was to being preliminary physical therapy in preparation for a double lung transplant they had to make a choice. Clearly such a pregnancy would compromise the window of opportunity for a transplant as well as her fragile health. Plainly put, carrying a baby to term would likely not happen, and the chances of her surviving such a pregnancy were slim. So they were counseled by the medical community which cares for her to abort. The greatest medical minds said the risk is too high. Being pregnant now is the worst possible scenario. And from a human and scientific perspective they were right. But they were wrong. So my son and daughter-in-law said "No" to the scientific rationale. Their reasoning? God is the Creator of life. They made a choice to be willing to risk her life, believing that God in His sovereignty had all this in His plan for them. It defies logic. But sometimes that's exactly what faith does: stares finite human reasoning in the face and says "You're wrong because God is always right". Do I have all the answers to all the questions? No. That’s why I’ve chosen to trust God. He does. Convictions don't come without a price. Belief in moral absolutes is so politically incorrect these days. But obedience never comes without reward. This story hasn't yet come to its conclusion, although it's getting there rapidly. But regardless of the outcome, it's what God thinks and reveals that counts. So for me, being "pro-life" has moved from being a political stance or even a theological tenet. As a new grandfather of an animated, expressive beautiful girl, born January 8 I’m more convinced than ever how precious and sacred is life. She grips with her hands, grimaces when her diaper is changed; kicks her feet, opens her eyes. I dream of the day when she’ll play at the beach and chase her dog around the house and sit on my lap. Born in her 24th week, a time when some would have us believe she still was not qualified to possess life, liberty and the pursuit of happiness, she is a tiny witness (all 1 lb. 6 oz. of her) to life. I no longer can stand at a distance and give token support to something I say I believe. My belief was challenged by circumstances beyond my control that faced me and those closest to me and forced a choice we will never regret. Partly because of the outcome; mostly because it was the right thing to do. It's become experience, and that makes it as real as real can get. On this day especially, I’m not standing afar. I believe I’m standing with the Creator who gives life. Could Revival Be Far Behind? Dr A. T. Pierson once said, 'There has never been a spiritual awakening in any country or locality that did not begin in united prayer.' From the little bit I have studied about the historical revivals that have on occasion swept continents with the unleashed power of God, the common denominator seems to have been a return to prayer by God's people, often beginning with one or two, then spreading and catching like wildfire. I'm wondering, after a week or so of reading comments from believers from around the planet if a revival is not being birthed. Those comments frequently point to an increased prayer life, which is my own experience as well. Yesterday in the worship gatherings in my church I asked, "How many of you prayed more last week than at any other time in your life? ", and the raised hands were everywhere. What if God decided to use the story of a young woman in a health crisis and the birth of her daughter and the love and faith that holds their family together to ignite a revival around the world? I believe it could happen. In fact I'm praying now for that very thing, and I invite you to join me. I may be wrong, but I don't know of a revival beginning in cyberspace. But why not? As the old song says, "Lord, send a revival, and let it begin in me." It was great to be back with Nags Head Church after last week away. So many offered their congratulations and assured me of their prayers for Tricia, Gwyneth and Nathan. I struggled to keep my emotions in check all morning. That's probably why I'm so tired now. A couple of different offers for lunch were turned down. I knew I just needed to get home and rest. Attendance was super. I know there were some there as a result of hearing about Tricia and Gwyneth and they wanted to be with us. I asked "How many of you prayed last week like you've never prayed before? ", and the hands were up all over. "And how many of you discovered blogging?". Just as many hands. My talk today was about The Things We Value Most as a church. Next week I'll share some thoughts about why life is so important to God, then the following week I'll wrap up this series as the church covenants together to be taithful to Christ and to each other. Again, thanks to an extraordinary fellowship for your prayers and encouragement. Will you go to WalMart...? I'm not a shopper. Like most men I avoid shopping at all costs, and when I do shop I go in, get what I already know I'm there to get, and get out. And on the Saturday before Christmas the last thing I want to do is go to WalMart. I'd rather get my teeth cleaned. But on Saturday, Dec. 22 our phone rang and Gail answered. It was Tricia, calling from Durham. "There's this camera I want to give Nathan for Christmas..." and she gave Gail the details over the phone. "They've got one at Kitty Hawk and they're holding it for you. Will you go to WalMart and pick up this camera?" I had no idea what that camera would do to mesmerize the blogosphere. Chances are you've seen the pics on my son's blog. If you haven't, you gotta see what that camera has done. It's a world changer, and I got to buy it. So my New Year's resolution is: Any time TRICIA asks me to go to WalMart for her, I'm going. Even on the Saturday before Christmas. After a good part of the last two weeks away from home and my office I'm back. It's a new office and I'm still organizing it. As I look around there are pictures to be hung, a book case to assemble, a desk that's becoming invisible due to the growing clutter. I did check through my mail and listen to my messages. Eventually I'll get to them. One day the office will be set up and my desk better organized. But not today. I shepherd a flock of believers along with 4 other guys, and my particular role is to lead the leaders and be the primary teacher of the congregation. Like it or not, right or wrong, they look to me to point the way and take the first steps in getting there. With what I've experienced and witnessed via my family, friends and so many who have partnered with us from around the world, I've been overwhelmed. Now that I've been able to step away a little, I can begin to allow the Holy Spirit to help me process it all - if that's possible. So please forgive me if you meet me or talk to me and I seem to have a far-away look in my eyes. I'm not a mystic kind of person, but my heart and mind are full of things way bigger than me and I'm trying to tie it all together and get a handle on it. If I tear up when you ask about Tricia, Gwyneth and Nathan, please be patient with me. It's not so much emotion as it is wonder and amazement at the God who is orchestrating this symphony and choreographing this dance. So I need to process it all as best I can. There's a life song here to be sung out loud, and I sure want to be part of the choir and get it right. After spending most of the week in Durham with family and friends and going through the most trying week of my life, we arrived home tonight. We're tired, but so grateful. And I'm trying to process everything I've witnessed this week. My mind never left it the entire 4 hour drive. We were torn about leaving, and got our laundry going ready to pack just in case we need to return. For Tricia and Gwyneth's sake, we hope we don't have to go back for a bit. They are holding their own. And what have I been doing the two hours I've been back? Reading blogs, comments and emails. It's become like food to my soul. Often when life seems to be totally hectic, unpredictable and totally out of my control, I’ll think, “I’m having ‘one of those’ weeks”. Usually it’s when the little things start piling up, and whatever calendar I’ve penciled in can be tossed in file 13. What tends to get me frustrated is my own idea that my life is to be lived according to my dictates, without interruption. How big I think I am. People who know me know that I’m a take charge guy. After all, somebody’s got to be. I’m a type A. But I’m also learning that some things are beyond my charge; out of my control. And that’s OK. This past week has not been “one of those weeks”. It has been a once in a lifetime week for my family. We have seen miracles happen before our eyes – things totally out of our control and out of the control of those surrounding us. Our emotions have been strapped in to the seat of the Apollo’s Chariot of life as we wondered, feared and rejoiced only to wonder, fear and rejoice again. Here’s something I discovered. God is bigger than anything life can throw at us. The enormity of the trial we faced last week was matched by His enormity. In so many ways He assured us that although things were out of our control, they were not out of His. Not only that, the great I AM also showed us the power generated when His people pray. Most of my week, it seems, has been spent reading hundreds of notes, mostly from people I’ve never met telling us that they are praying. Primarily through the relatively new medium of a blog, they have reached out to God and to us by the tens of thousands from around the world. I know that because our blogs have counters telling us how many hits we’ve received. And it seems the world has turned its attention to a family from Nags Head. It’s been a God thing – something I could have never imagined. Just as He proved Himself to Moses, a nation of Hebrew slaves and a world power Egyptian empire, He continues to prove Himself to me and many others today. He can do what we think is impossible. He is in control. He is still “I AM”. As I write this I’m sitting in a little waiting room at Duke University Medical Center. I’m no more than 15 feet, separated by a hall and a wall, from my daughter-in-law who is clinging to life. Three floors below me in the intensive care nursery is my two day old granddaughter, born just shy of 25 weeks and presently weighing in at 1lb. 5 oz. That’s not a typo. We have seen and continue to see the hand of “I AM” take charge. It’s been an awesome sight to behold. 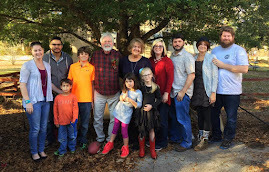 If you would like to know more about the miracles happening in our family, please visit the following blog: http://www.cfhusband.blogspot.com/. See if you aren’t equally amazed. Last night Nathan and our friend Paul Lawler were in Gwyneth's room when test results came back showing that she was virus free. That meant they could take off the latex gloves and reach into her controlled environment and touch her, which of course, Nathan did! He came back into the waiting room, where Gail, Brenda Lawler and I were sitting and once again broke into tears. "I got to touch her". Then he said something I'll never forget to Gail and I. "Do you want to go in to see her and touch her, too?" Duh. We jumped up, did the scrub thing, put on the gowns and touched her little back and arms. We can't pick her up yet, but this was so cool. I've just looked at Nathan's pictures on his blog site. As good as they are, you just had to be there. And I was! PS Please take a few minutes and read Tricia's sisters' accounts of Tuesday's events. Their blogs are here and here. I promise it's worth the read. We hurriedly said goodbye to them Monday morning as we rushed to get away to be here at Duke, thinking we wouldn't see them for a long time. But they managed to get their truck packed and left this afternoon, making a detour to come here on their way. They got to peek in on Tricia and visit Gwyneth. So, tomorrow morning we will say "Goodbye" again to them, knowing they'll be far away but also knowing they're doing God's will in their lives. God bless you, Terry and Sarah. We love you. Please come home every chance you get. And now I have a good excuse every February to slip away to FL for some Spring Training baseball! Now back to our previously scheduled program. I'm hearing from so many that my daughter-in-law's and now grandaughter's stories have them in a full Nelson. I fully understand. The only time my lap top isn't on is when I'm in the car or asleep. My work is piling up. But somehow that's OK. Everything else is now on hold. Why is it that this story has captured so many? Let me suggest a few reasons. We're all looking for something to cheer for, especially an underdog. We live in a culture (for better or worse) that thrives on "reality" entertainment. I'm here and this is as real as it gets. We're always looking for heroes. Many of us have found them through Tricia's story. I know I have. Miracles aren't every day occurances for most of us. I think this story qualifies. Most importantly, many of us are looking for the kind of faith, hope and courage you're finding in this story. Some have told us their faith has been renewed. Others, we trust, will discover how to possess the same faith in Christ Nathan and Tricia live by. One day I'm sure we'll look back on this and have a fuller appreciation for all that took place. Right now it's hard to process; at least it is for my mind. My life is currently consumed by their fragile lives and their unbreakable faith. However, when the dust settles your life and mine will go on. But I know that my life cannot ever be the same again. And I sense from many of you who have called, commented and emailed that you feel the same. It's OK to be consumed by something. Just make sure what consumes you is of eternal value. A lot of people, upon the news of a child's birth, will send flowers to the mother. And with "Gwyneth Rose", it just occurred to me that some people will be getting ready to do just that. Let me ask you to hold off. (Sorry FTD). Both mother and daughter are in intensive care units and plants and flowers are taboo. The reality is they'll both be there for some time to come. Cards? Absolutely! Tricia has a whole wall dedicated to cards and photos. And if you sent flowers, Nate would have to take them to his apartment, and he spends precious little time there. So patiently wait. The day will come for those kinds of expressions. Now the best thing you can send is your prayers to Tricia's God. But if you just gotta do something more "tangible", why not send a donation to Tricia's Trust Fund at www.65roses4pattysue.com. They took Tricia down to OR just before noon. We got a call just after 1:00 that the tracheotomy went well and that she was stable. However just a couple of minutes later we were told that they were proceeding with the C Section. So we all rushed down to the surgical floor to join Nathan. The wait seemed like forever, but about 45 minutes later the OB doctor came in and said the C Section went well and that Tricia seemed stable. The wave emotion that swept over us was huge. Lots of tears. Prayer of thanksgiving. The baby weighs about 1 lb. 6 oz. She's been intubated and is in NICU. We've seen a picture the doc took on his blackberry. She's tiny, but has hair on her head! Tricia's been taken back to ICU where they're tweaking her ventilation. For the time being she's kept under sedation and paralysis to keep her still. Her pulmonary doc met with us a few minutes ago and told us what took place. There were about 75 people in the OR and he said they all did their jobs well. He also said Tricia's chances of survival from this are still "iffy" at best. Nathan seems to be doing OK now. It was tremendously emotional for him, as you can imagine. He's been in to see Tricia. Later we'll get a visit from someone in NICU to update us on Gwyneth's status. So please, if you're part of the prayer effort, don't stop now. Both mother and child are critical at this point. But all of us here know that all the prayers helped us get through this. And the doc was wrong about who was in the OR. There was One he missed. Briefly our granddaughter will be born either this afternoon or tomorrow. Gail and I are headed back to Durham today. Check Nate's blog for info and updates. And please be praying. This is extremely high risk for both Tricia and the baby. It's now after 6PM and we're still at Duke. Our plan is to leave later this evening and drive home (about 3.5 hours). Lots of visitors have come today to see Tricia. Included are friends from VA Beach and the OBX, aunts and uncles and a cousin from VA and NC and grandparents from OK. She slept all morning (thanks for the prayers about her getting enough sleep), so no one got to see her until later, because she also got her hair washed. Good news is that her CO2 levels are maintaining and her blood sugar is under control so that they're taking her off the insulin drip. The baby is doing great so far. Again, the goal is January 18. I can't begin to tell you the enormity of the response we've seen, heard and felt from around the world. Nathan's blog as a map of the world showing where people are who are visiting his blog. We're getting phone calls and emails from all over. I'm sure the angels are busy answering that phone bank as the prayers go up. The reports I've received from NHC today make me so grateful for being part of a healthy church. You guys rock! Community is an amazingly awesome dynamic and it is so much a part of who we are as a church family. Thanks to Andy for covering for me this AM. Thanks to all of you who took the time to make a video greeting for Tricia and Nate. I know that will get them stoked. Bless the Lord, O my soul and all that is within me. Bless His holy name. While my church family starts their second worship gathering I'm sitting alone in a tiny waiting room in a hospital reading blogs and emails. I'm really torn, but know I'm where I need to be today. I also know things are going incredibly well back at church. Healthy churches, built upon God's purposes and not on a man get along quite well regardless of absences and storms. Plus I know that God is being bombarded this morning by praying people, not just in Nags Head, but all around the world, lifting up my family before His throne. So I wait. Some sniffles have caused me to stay out of Tricia's room today. Don't want to risk anything for her. My parents are almost here after driving from OK, and my brother and his family are coming in also from VA, along with some of Nate and Tricia's friends and my sister from nearby Raleigh. So I won't be alone long. In fact I'm not alone now. And don't think I'm not worshipping, either! Just wish I could hear the singing at NHC. He's had thousands of hits in the last couple of days and what's happening is truly a phenomenon of love and prayer. After a couple of days that looked up for Tricia today's news is not good. They're moving her into ICU due to her increased CO2 levels, which indicate she's not getting enough oxygen, nor is the baby. If levels do not improve they'll put her on a ventilator - again, not a positive thing, especially for her transplant hopes. If the ventilator does not improve her oxygen levels they will deliver the baby in the next day or two. She hits the 24 week mark tomorrow and is at extremely high risk. The C section is also extremely high risk for Tricia due to the anesthetics and risk of infection. These two young people have an incredible faith in God and courage beyond anyone I know. They are making decisions right now that I have never had to make and could not fathom.